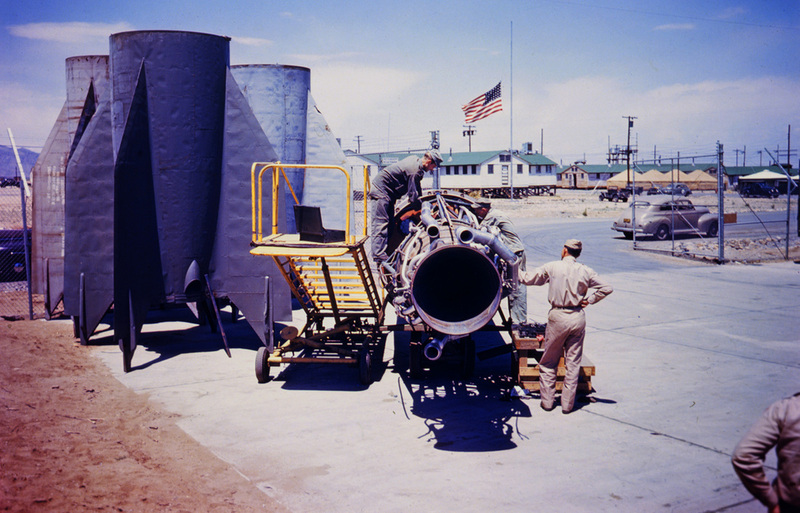 The American space program blossomed in the New Mexico desert in 1946, thanks to the infusion of as many as 100 captured German A-4 (V-2) rockets, and a little more than that many German rocket scientists who agreed to come to the United States when the war ended. 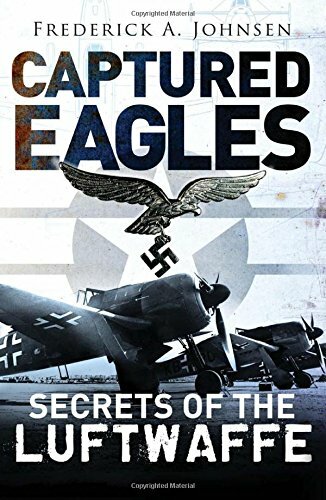 The Germans were not forced to come; they agreed, with charismatic leader Wernher von Braun, that as a group they would make entreaties to the Americans as the war ended, rather than risk being coerced or cajoled into helping the nascent Soviet space program, or efforts by France or England. The scientists even maneuvered, at some personal risk, to be closer to the American forces at the time of Germany's defeat. They stashed documents which the Americans were able to recover. Germany, nonetheless the German rocket scientists became the nucleus of American postwar rocket efforts. Quick-acting American forces entered the V-2 construction complex at Nordhausen, Germany, in April 1945, ahead of the Soviets, even though Nordhausen was in the projected Soviet portion of occupied Germany. The Americans shipped off enough components to build about 100 V-2s; what remained at Nordhausen when they departed was mostly damaged goods, to the chagrin of the Soviets who came later. The Russians were able to assemble about 18 V-2s with German, and sometimes Soviet-made components. This disparity in war booty would shape the rocket programs of both nations. The Soviets essentially built their own V-2s, a slightly modified rocket called the R-1, while the Americans reveled in a bounty of German V-2s. impatient to move on to new missiles. landing on the moon in 1969. I’ve been fortunate enough to have driven a number of full size steam and diesel locomotives at museums that have rental programs and occasionally where they don’t. But this was the big time. 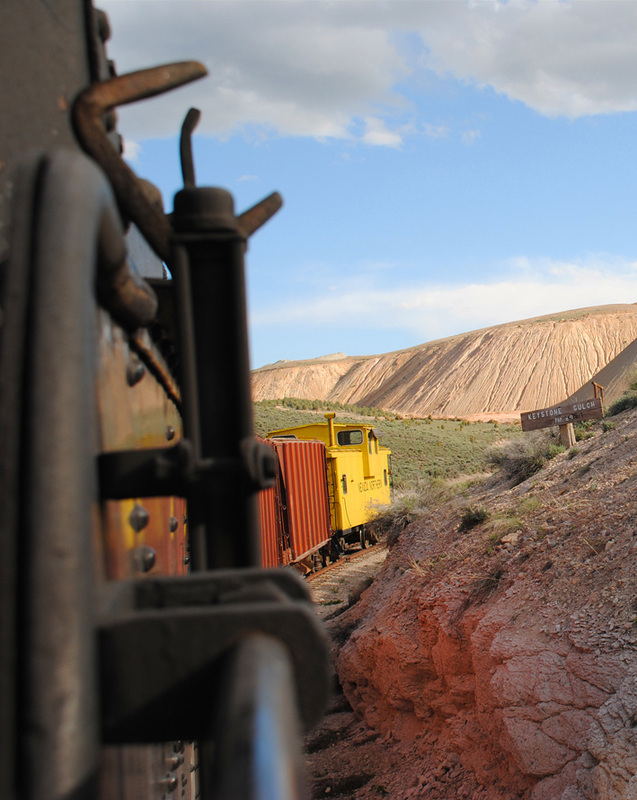 I was about to operate the awesome 1909 Baldwin 2-8-0 at the Nevada Northern Railway Museum at Ely, Nev., with a freight train made up of ore cars and a bright yellow caboose. NN had just started this new program where “rental engineers” could study the rulebook in advance, get some one-on-one instruction and try their hand at running a whole train. Much different than running a light engine. My wife Claudia, who enjoys seeing me happy, and I arrived the afternoon before my scheduled adventure and we watched as they put the engine away that evening. All the while I was going over procedures in my head. I had read their online Operations Manual, Track Warrants and Op Train Orders. I had taken the open book test weeks ago, but being familiar with procedures is nothing like moving tons of steel that is belching steam and smoke. I am not a real railroader and had no experience at all until about four years ago when I was bitten by the bug. I was going to be around real experts and I have my share of that "guy disposition" where you don’t want to look bad around machinery, new guy or not. For the past three years I have operated 1/8 scale live steam as a volunteer at Auburn Heights Reserve in Delaware. 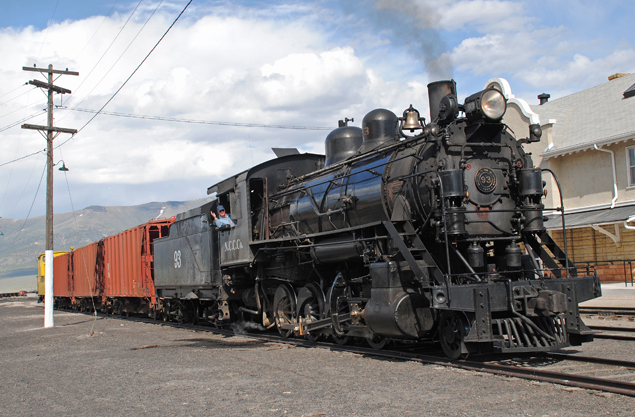 That scaled-down locomotive weighs a ton and can pull 20 passengers; Nevada Northern's Number 93 weighs 100 tons and can pull hundreds of passengers -- it’s not really the same thing. Early the next morning I arrived to take on the first challenge. Since getting to Ely, Nev., involves a four and a half hour road trip from Las Vegas I figured I should do two different engines to take full advantage of the trip. (Did I mention my tolerant wife?) I first operated the Nevada Northern's vintage Alco RS-3 diesel, including start-up and a 14-mile workout in the countryside around Ely. I would have gone home very happy --except I came to run the steam train. At noon we started out with a walk around the old 2-8-0 which has been extensively restored to excellent running condition. Next we had a crew briefing. My wife was going to ride with us in the cab and take photographs. The fireman, who was a volunteer in from California, briefed Claudia where he was going to need to be and where she could stand and occasionally sit. The cab of a hand-fired steam locomotive is a busy place and we all had to work together. The Westinghouse Air Brake is an awesome invention from the 1890s and it is still in use today essentially unchanged. It is not like stepping on your brake pedal in a car. When you are running “light”, just an engine, you only need to use the independent brake which is pretty straightforward even if it does have several positions, including a “lap” position that holds whatever rate of application you have selected until you release the air holding the brakes. There is also a slow app and a quick app, a running and a full release position. Simple, right? They don’t just turn you loose with the train; first you take the engine out on a straight stretch of track and make a few controlled starts and stops. The throttle on a big steam engine is simple but complex at the same time. In theory the more you open it the more steam is admitted to the cylinders and the faster the engine goes. In reality on Number 93 it’s a big honkin’ three-foot bar of steel that pivots with a movable locking tooth that is released by a squeeze handle at the end of the throttle bar. When you release it from fully closed it springs out a few inches just getting to its useful travel. Every action taken in the cab of an engine has a delay. Applying steam to the motion, braking, building steam -- you have to work ahead of the power curve. You pull out a few notches of throttle and you can hear the steam reaching the cylinders. If you want a smooth start you back off just a bit and then pull out a few teeth at a time. Close the throttle, give a slow app and the engine will come to a smooth stop. Demonstrate that a few times and you are off on a seven-mile run up a pretty steady grade that maxes out at 2.2 percent. Enough grade that the engine will talk to you a bit, even when light. On a steam locomotive if the throttle linkage gets caked with soot or grime it can get difficult to move. Number 93 is just right, smooth with just a hint of force to move it. The real engineer takes over at the Keystone Wye and turns the engine around by making a three point turn. Simple enough with an engine alone, but they don’t let renters do it, just in case. On the return trip it’s all about braking. You have to brake and release, you don’t want to drag the brakes because they will build up heat. And here's one of the real “little boy” pleasures of this experience. The first time or two I blew the whistle for a grade crossing it was crisp and all business. Then I started modulating it and we heard that whining note that makes whistles much more interesting than horns. Even though there is a pretty steady grade on the main line out to the copper mines there are enough dips and curves that you have to keep adjusting the throttle and occasionally add a little brake. I had a different instructor engineer on this run and he was trying to get me prepared for using both sets of brakes which would be needed when we operated the whole train. Truthfully I was a bit clumsy and he was (understandably) hovering a bit close for me get a feel for using both brakes at once. I was not really getting it. I understood it in theory, but was not grasping the finesse of using two hands to apply one set of brakes while releasing the other. This was my big day and I was not living up to my own expectations. I was afraid I was going to blow it. I did well enough but he stayed close enough that I knew he was not fully sold on me. Through a twist of fate he had to take a break after the first run and Adam, the Senior Engineer, came back to be my instructor on the Big Run. Senior is a relative term; I qualify for the senior discount at the movies. Adam is young, but he is really good at what he does. When he went over procedures I told him about my hesitation to use both hands at once. He let me use one hand to dance on first one and then the other brake stand. Bingo, I got it, and quickly I went from nervous to ready. They don’t let rental engineers hook up the consist either, but they do talk you through the process so you learn quite a lot while it is happening. We hooked up our empty ore cars and that bright yellow caboose. When we were ready to depart he had me make a few starts and stops and very soon we were on our way. It took me a while to realize it, but operating the whole train was easier for me than the light engine. Why? Because the train acts as a “flywheel” smoothing out the changes in power and braking. I had to make far fewer power adjustments, and braking on the downhill leg was relatively easy. I also noticed that part way on the outbound leg Adam had stepped to the rear of the footboard. Subtle, but he was giving me room to learn. People say great adventures are all too soon over. Maybe, but my senses were so tuned in to what we were doing that I felt like it lasted all day. It was truly a meaningful experience. I was only the second person to reserve the whole train rental so it took us a bit longer than it might in the future, but this was not something anyone wants to rush. I have a lasting memory and some great photos. I’m smiling like a kid in many pictures, deep in concentration in others. Was it worth it? You betcha! Would I do it again? Well, it’s not cheap. It’s worth the money, but I’d probably stick with renting a light engine for less than half the cost. I’ve driven about a dozen different engines now and I want to add some more to the list. But unless someone starts renting out UP's Challenger (not gonna happen) this will always be my top-of-the-line experience. 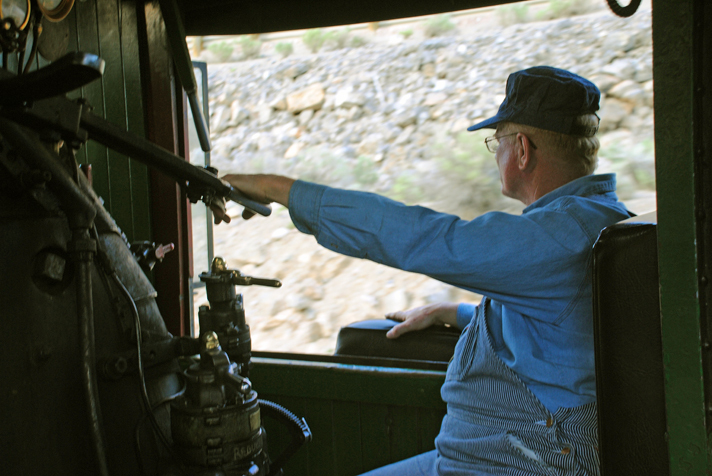 I tip my hat to all the great folks who keep the Nevada Northern running. It’s a tough job, but they have saved a slice of real American history. Go visit and see for yourself. 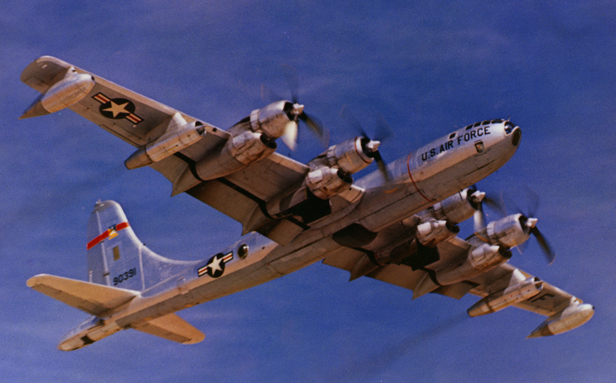 numerous upgrades, and it has been said the appearance of building new B-29s after war's end could meet with more congressional resistance than building new B-50s. 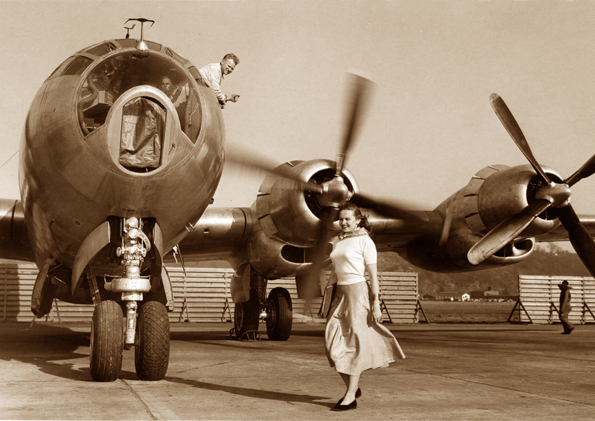 News releases of the day said the B-50 was a 75 percent new airplane over the B-29, using stringer, lighter aluminum, almost 60 percent more power, a larger vertical tail, electrically de-iced cockpit glass, a nosewheel steering tiller and other features. 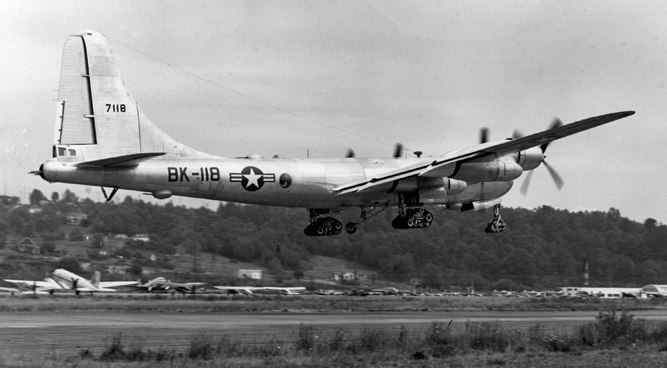 Early models of the B-50 retained the B-29-style nose. The B-50D introduced a new nose with a one-piece clear upper section and a new flat bombardier's glass panel. The B-50D also featured outboard pylons typically carrying a 700-gallon streamlined fuel tank. According to Peter M. Bowers' "Boeing Aircraft Since 1916", the pylon could also carry a 4,000-pound bomb instead of the fuel tank. 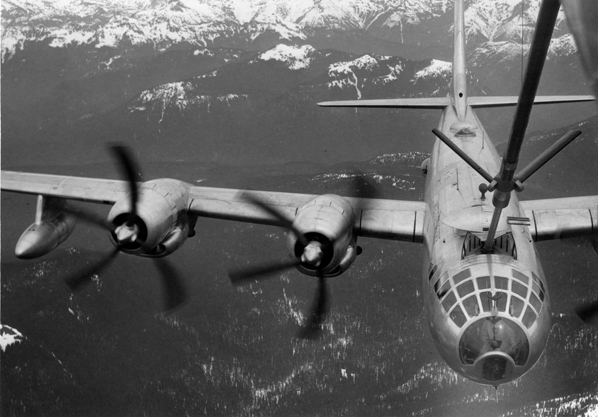 External differences -- notably the vertical tails and engine nacelle configurations -- are evident in this Boeing photo of a KB-29P refueling a B-50D. "Lucky Lady II", a B-50A from the 43rd Bomb Group, made the world's first nonstop globe-girdling flight, finishing March 2, 1949, about 94 hours after takeoff. Four inflight refuelings by KB-29M hose-and-drogue tankers were needed. Pilot was Capt. James Gallagher. The flight began and ended at Carswell AFB, Texas. The fuselage of "Lucky Lady II" became a display in the pioneering Planes of Fame air museum at Chino, Calif.
dive bombers and running them down. the Japanese. Jeff Dorroh, the exec, hit eight Vals and saw six hit the water. The other two were put down as probables. CO, Maj. George C. Axtell. from Okinawa. 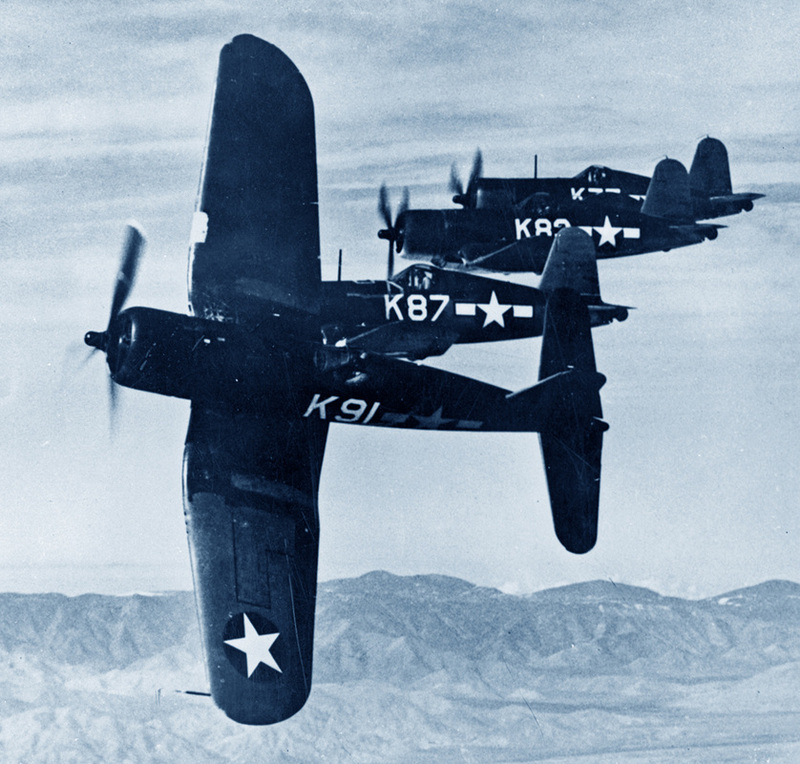 At the time, VMF-323 flew a mixture of F4U-1D and FG-1D versions of the Corsair. With its mainwheels spanning a distance of nearly 26 feet, perched on only one main tire per side, the B-24 Liberator had the potential to slew out of control in the event one of the tires was flat. The Dash-1 pilot's manual outlined standard procedures for landing a Liberator with one bad main tire: "After landing, put the nose wheel firmly on the ground. Use the engines on the side on which the tire is blown, concentrating on the outboard engine, and use enough brake on the good tire to keep the airplane rolling straight. It may be necessary to blow the good tire out." surface like the crushed coral runways used by the 5th Bomb Group in the Pacific. Serving as Group commander in 1945 at Samar in the Philippines, Lt. Col. Albert W. James once coaxed a B-24 crew to shoot out a good main tire to balance a flat on the other side as a pre-landing safety improvisation. He made the unorthodox decision to have the crew shoot their remaining good main landing gear tire on one of the group's B-24 Liberators after the pilot radioed that the main tire on the bomber's left side had blown out on takeoff. To land the Liberator on the coral with one flat main tire and one good free-rolling tire would have caused the bomber to pull violently in the direction of the flat tire. As Colonel James had already seen too often, the careening aircraft could swerve into one of the large drainage ditches bordering the runway, probably crumpling as it tried to conform to the terrain. A killing fire sometimes ensued in the wreckage, James recalled. 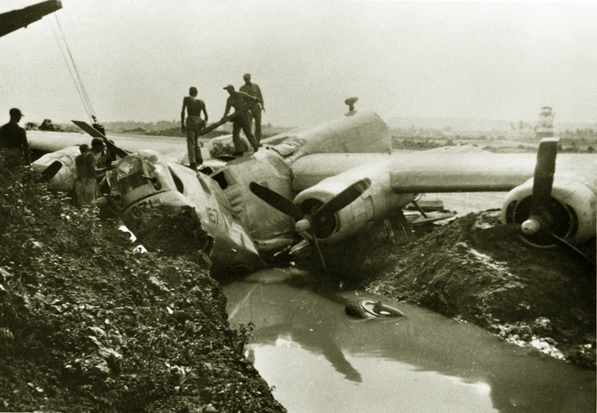 The drainage ditches, which ran parallel to the runway, were needed to carry off water from torrential tropical rains that otherwise would have flooded the crushed coral runway. The jagged fragments of coral worked their way into the rubber tires, adding to the problem. Robert D. Houghton led the 5th Bomb Group's 72nd Squadron when he was 27. In his letters back home written in early 1945, Houghton blamed loading of the Group's Liberators for some of the serious blowout mishaps: "They have been giving us the old-time heavy loads to take off lately and we have lost two crews in the squadron in a month -- blew a tire on takeoff and with such a heavy ship it is impossible to keep control. Both crashed and burned. Believe me, I go over my tires with a fine-toothed comb looking for the slightest bruise or cut -- it pays." "The damn officials are still tonnage happy", Houghton wrote in another letter. "The 13th (Air Force) is flying more tonnage miles per month than any other similar heavy outfit. I grossed out day before yesterday at 70,000 pounds (64,000 pounds is the designed load limit) in the pouring rain, on a soggy runway, with a ship 2,000 pounds tail-heavy (4,000 pounds of bombs in rear bomb bay, 2,000 pounds in front bomb bay) and 2,000 pounds right wing heavy. I never worked so hard in my life keeping that tail-heavy ship straight when a wheel would hit mud and water and send it flying so I couldn't see a thing -- finally mushed off the end of the runway and got flying speed. Got the rest of my squadron together and just started turning on course when I saw a ship swerve on the runway, burst into flames and slide a thousand feet like a Roman candle. That closed the field so no one else could get off, so our squadron went on to the target alone (Borneo)." The problem with B-24 blowouts on the coral was partially solved by fitting the Liberators with heavier-duty tires designed for the larger Boeing B-29 Superfortress, Colonel James said. "When you had a blowout," he remembered, "you usually lost everybody in the plane and anyone else foolish enough to get near it," because of fire and the danger of bombs exploding from heat. just moments before liftoff, when the airplane already had built up enough lift to take it aloft. The incident occurred between the dropping of atomic bombs on Japan and the official surrender. "We were no longer pulling bombing missions, but were patrolling the Chinese coast" on the lookout for possible Japanese troop build-ups that would signal a last-ditch stand, Colonel James explained. Because of the patrolling nature of the mission and the distance from Samar to China, the B-24 was fully loaded with gas. 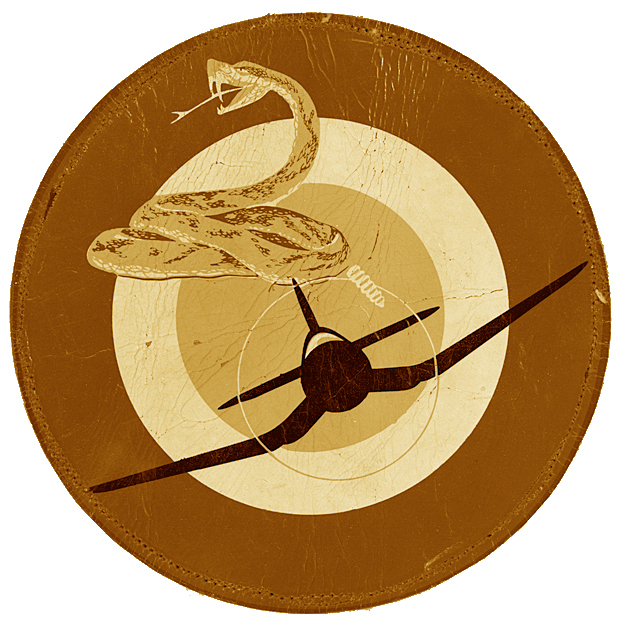 The Liberator took off early in the morning -- about 6 a.m., James recalled -- and spent the rest of the day until about 4 p.m. circling near the field, burning fuel to reduce weight and lessen the danger of fire upon landing. Another Liberator was dispatched to perform the mission. The pilot of the damaged airplane flew at a faster-than-normal cruise speed and used a rich fuel mixture to burn off gas faster. 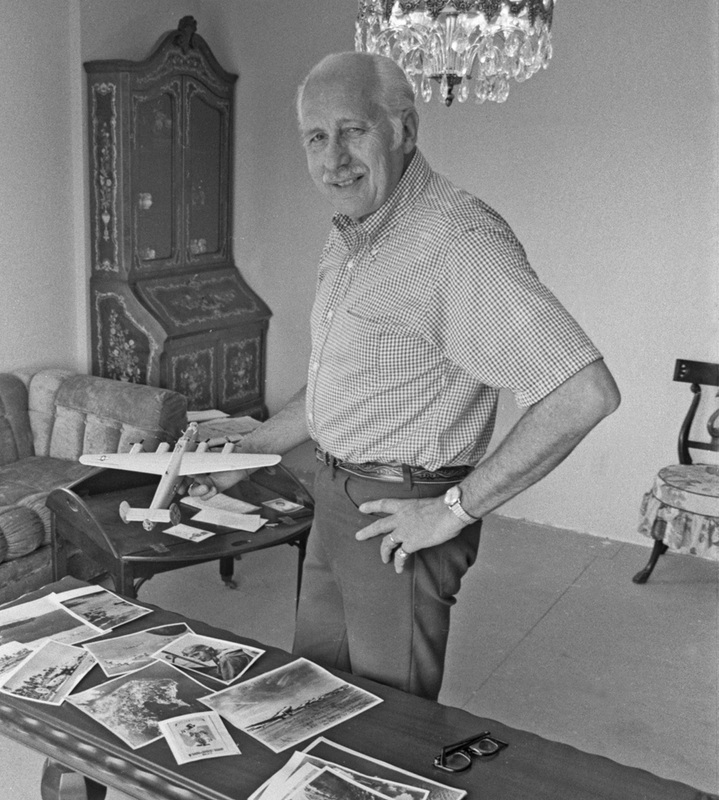 Colonel James stationed himself near the runway in his jeep which was outfitted with and aircraft radio which allowed him to monitor radio command channels during all group takeoff and landing operations. runway. He had arrived at that decision only after he was sure the other tire really was flat. "I didn't want to be in the position of shooting out the good tire, and then discover the other was good too," Colonel James explained. The crew chose to ride the bomber in for landing rather than bail out, an activity sometimes more hazardous for the inexperienced than landing a crippled aircraft. Seven of the 10 men aboard were not needed for the impending landing operation and could have elected to bail out, James said. The right waist gunner punctured the main tire on that side of the B-24 with a single round he had removed from the ammunition belt and placed in the breech of his .50-caliber machine gun. "It was the only thing I figured they could do and land and stay on the runway," Colonel James said. 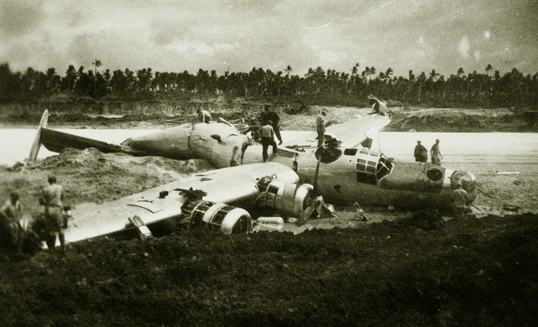 A wheels-up landing in the B-24 was not advisable, especially on the packed coral runway. When sufficient fuel had been burned off, the pilot cut his speed from a fast cruise of around 180 miles an hour to a landing approach speed of 110, and then still slower as landing flaps were extended. "I remember coaching the guy as he came in to plan to use the outboard engines to steer with in case he started to veer off the runway," James said. Brakes would have been of dubious value with two mushy flats, he added. Once slowed down on the runway, the rudders would lose their effectiveness for steering, leaving only the outboard engines to guide the path of the crippled Liberator. Even the engine-steering method had hazards, James said, because of "a terrible lag which must be anticipated by the pilot before an engine revs up enough to give the necessary thrust to steer with." Such a lag in response could give a misdirected bomber time to get itself in trouble. Fortunately, James' original idea of balancing the B-24's path of travel down the runway by flattening both main tires worked like a charm. "He went straight along the runway," flopping two equally flat main tires, and riding on a good nosewheel, James said. The silvery Liberator came to a stop very quickly on its two peg legs, using less than half the runway length. The landing gear was only slightly damaged, and an almost certain fiery disaster was avoided by Colonel James' engineering on the fly. Material contained in this website is intended for historical and entertainment value only, and is not to be construed as usable for restorations, maintenance, or operation.